About this edition: This edition contains a teaser of the first chapter of the next edition (Death Walks in Eastrepps by Francis Beeding). About the author: We don't know much about Seldon Truss other than his full name was Leslie Seldon Truss, he is from the UK, and lived 1892-1990. He also wrote as George Selmark. His writing style about the savvy adventurer type reminds me of Leslie Charteris. He has one other title in the Mystery League series: The Hunterstone Outrage. One night Elizabeth Wild has a late encounter with attorney Basil Gorman in the study at Brede Hall, which ends with a broken window, and Gorman shot and wounded on the floor. She disappears and is immediately suspected. Mr. Penn encounters her and takes her on as his assistant, to find her father Barrington Wild, who has been kidnapped. Elizabeth had been trying to negotiate the return of an embezzlement confession, signed under duress by her father, an employee of the law firm of Latchmer and Gorman. The firm has a history of representing society debutantes who marry then die unexpectedly, with a resulting transfer of wealth. Latchmer dies from mysterious causes. Mr. Penn discovers a system of coded newspaper advertisements being used between the firm and society households. Elizabeth, under the name Elizabeth Parsons, is placed as a maid to spy on the Vereker-Dane household; and promptly finds herself in peril. The Temple of Youth beauty parlor is more than it appears. This is quite a tangle of intrigue. We have society matrons, a beautician, and lawyers dealing in a shady scam triangle to set up debutantes with proper marriages, then causing their deaths to cash in on their estates. Mr. Penn of Pentonville will immediately bring to mind Simon Templar (The Saint) of Leslie Charteris books, and fans of The Saint will feel right at home. He is an adventurer operating under an alias, just on the outside of the Law. Wealthy, with a fast car and fast fists. 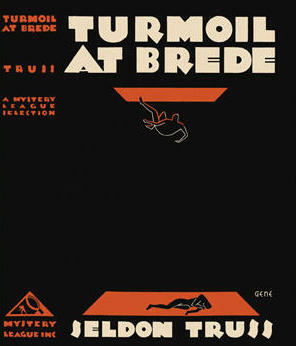 The action takes place at Brede Hall, the stereotypical country manse; complete with a tower and dungeon - and the Temple of Youth, an elaborate beauty parlor complete with hidden rooms, paintings on the wall with the eyes cut out so spies can peer through them, and a beautician who enjoys performing lobotomies on undesired witnesses. Mr. Penn's true identity will come as a surprise.